Work your way up to becoming a professional soccer player with the All Surface Reflex Soccer game! Featuring a carrying handle for easy transportation, the Mookie Soccer Swingball set is suitable for indoor and outdoor use. This portable and compact game can be played on any surface such as concrete, decking, grass, and even sand. From your backyard to the beach, enjoy hours of intense soccer fun! Play with friends taking turns kicking. No friends around? No problem! The Mookie reflex soccer game features a unique recoil action that allows for one-person soccer training. Practice your goalkeeping skills by placing the base in front of the goal, kicking the ball away and trying to catch the ball when it comes flying back. Soccer games for kids are an excellent way to encourage active play and exercise, build endurance and muscle, improve balance and coordination, and develop gross motor skills and reflexes. Enjoy of easy and hassle-free setup. Use the air pump (included) to fill up the string-attached soccer ball, fill the base with sand or water for stability, and then set the desired cord length by adjusting the spool located at the bottom of the base. Just like that, you're all set for the ultimate Reflex Soccer Swingball experience! Featuring durable and weather-resistant components, this kids’ soccer set is built to last. Includes Soccer Swingball base (11 x 11 x 3 inches), length-adjustable nylon string measuring up to 55 inches long, vinyl soccer ball, inflation pump, and detailed assembly instructions. Color: Base- Red. Recommended for ages 6 and up. 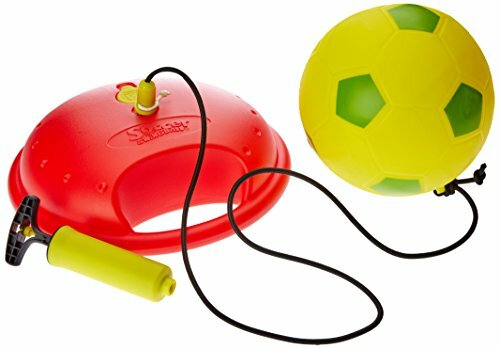 INDOOR & OUTDOOR SOCCER: Work your way up to becoming a professional soccer player with Mookie Swingball Reflex Soccer Game. From your backyard to the beach, enjoy hours of intense soccer play! PLAY ON ANY SURFACE: Including durable and weather-resistant components, this portable and compact set can be played on any surface such as concrete, decking, grass, and even sand. EASY SETUP: Fill up the string-attached soccer ball, fill the base with sand or water, adjust the cord length and you're all set for the ultimate Reflex Soccer Swingball experience. ENCOURAGE ACTIVE PLAY: Soccer games for kids are an excellent way to build endurance and muscle, improve balance and coordination, and develop gross motor skills and reflexes. SPECIFICATIONS: Includes Soccer Swingball base, length-adjustable nylon string measuring, vinyl soccer ball, inflation pump, and detailed assembly instructions. Recommended for ages 6 and up. If you have any questions about this product by Swingball, contact us by completing and submitting the form below. If you are looking for a specif part number, please include it with your message.